Hello, friends! I hope you’re all having a fantastic weekend. We had a fairly low key weekend, and I was able to get some projects finished and photographed. This coverplate die from Papertrey Ink is seriously one of my most favorite holiday dies ever. It looks beautiful so many ways, but one of my favorite ways to treat these beautiful cover plate die cuts is to watercolor them to bring out all of the incredible details. I started by die cutting the cover plate from an A2 sized panel of watercolor card stock. This one is not quite as intricate as the Garden Gild cover plate, so I didn’t have to use anything besides my shim in my Vagabond to get a perfect cut the first time. I love when that happens. I took several shades of green and Deep Red and Tea Rose pinks to color the different floral elements. I simply added some color to the centers of the flowers and leaves, then pulled the color out with my wet paint brush. For the panel behind the cover plate, I used my Twinkling H2O’s to add some very subtle gold shimmer to another piece of watercolor paper. It’s very slight, but in real life it adds some beautiful shimmery shine. 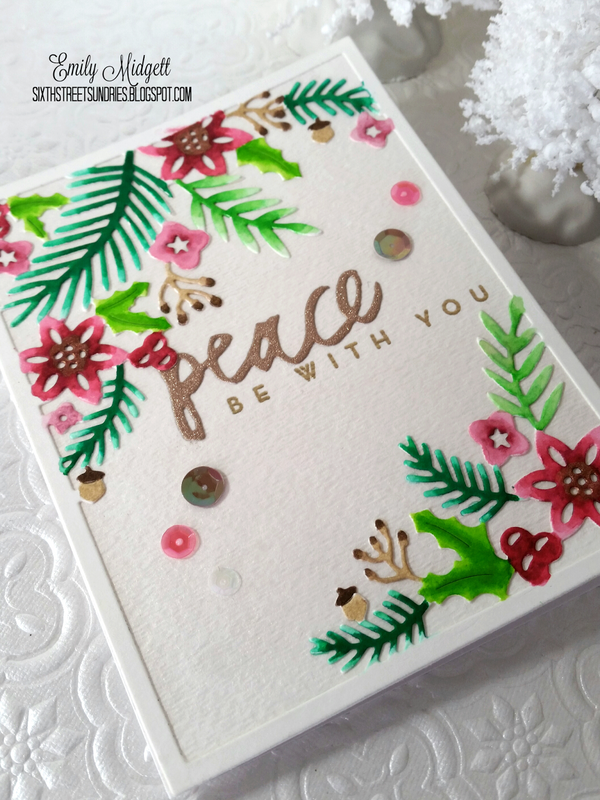 I die cut the “peace” from Wet Paint Holiday using DCWV Glitz paper, heat embossed the “be with you” in Princess Gold, and glued the cover plate down. The last little embellishment was to add some sequins from Lucy Abrams in shades of champagne and pink. I hope you enjoyed this card! It’s super flat, so I (well, actually, my hubby is the one who runs things to the post office for me) won’t have to actually go inside the post office, which is always a plus in my book. I’ll be back tomorrow with a sneak peek for my Butterfly Reflections Ink post! Have a great rest of the weekend, everyone!